“…Sometimes just throwing out your fears and your doubts, that ironically is not what we do very often in the church. So we kind of cover it up and “let’s not talk about it,” but that which is hidden is empowered. I want my life to be reflecting a relationship with the God that is actually bigger than any of my questions. If God is smaller than my fears, then He is not God. But it’s not just with our doubts and fears, it’s with so many other areas of our life as well. We think God can’t handle the truth of who we are so we make Him smaller than He really is…either God is big enough to shine in these dark places or He’s not God at all. That for me, that’s sort of what these songs are, attempting to just bring light into these dark places…” Wow, that’s some pretty heavy deep and meaningful insight right there, from one of today’s most prolific, acclaimed and respected singer/songwriters, Jon Foreman. Also lead singer of the rock band Switchfoot, Jon has this year embarked on a venture so big and grandiose, and pulled it off with great style and with a professionalism and greatness that is sure to propel him to higher height than now, and possibly into mainstream avenues where Jon can overtly share his faith with Jesus. 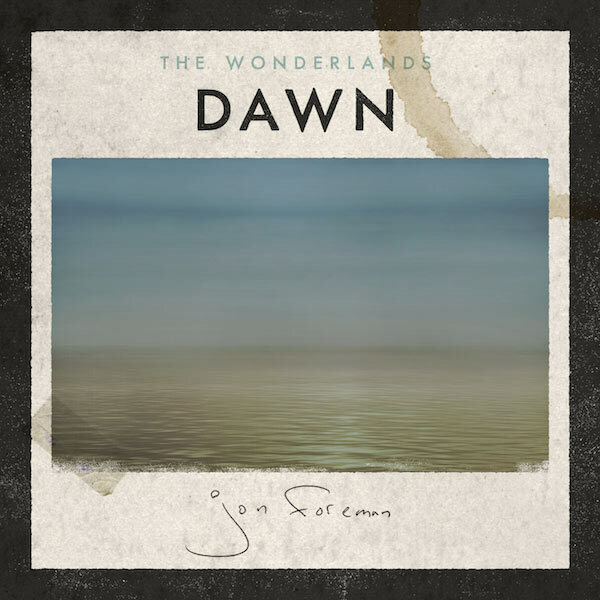 In my opinion, Jon is one of the most emotional, vulnerable, honest and lyrically profound singer/songwriters as he has created musical gems and treasures yet again, with his fourth and final EP in the series Wonderlands. Releasing Dawn this past month; the pinnacle of lyrical and thematic progression in the series of the 24 hours of the day, sees Jon going as deep as he’s ever gone. As you all know and are aware, from reading my previous three reviews of Jon’s EP’s Sunlight, Shadows and Darkness Jon’s prowess as a singer and songwriter is probably unparalleled- most melodies, if not every song, that Jon dishes out, is pure gold. It’s the same sentiment and trend here, and I am immensely proud of Jon for following a dream and allowing God to move to ensure that the best product possible was made. So let’s see how does this EP stacks up against Jon’s previous solo albums, EP’s and the entire Switchfoot discography. The allusions and references to the dawn, and notion of hope arising from the darkness, creates a sense of security and relief, so let’s dive in toe see what Jon imparts to us in this final instalment. Starting off the EP with the revealing and inspiring acoustic guitar ballad “Inheritance”, Jon opens up about his deep, deep love for his wife, reiterating that all the money in the world could not compare to the unconditional love he has for his wife, and she for him. Somewhat a metaphor for a fraction of what God’s love is for us, we are reminded that Jon’s wife’s ‘…heart is a work of art, I wanna be rich in memories not money, our love is our inheritance honey…’; the story in song and narrative focuses on how Jon wooed his wife. A deeper listen to the song implies that God woos us the same way, and as we remember that money isn’t everything, what Jon has done expertly here is to leave the melody open ended, so that people from all walks of faith can fully appreciate the song. If money isn’t our master, what is it? Food for thought right? Hopefully more and more people can come to Christ through this multilayered melody. A glance through the rest of the EP confirms that this release is the most overtly Christian of the 4 releases, and I guess that’s fitting when you think about how after the darkness, after the times when we are in the pit of despair, we need something to get us out of our funk, out of the mess we’re inn, and that person is Jesus. Case in point stars off with the next song “Run Free”, inspired by Isaiah 61, an out and out worship tune driven by keys, where Jon refreshingly points out in this soft and slow tempo song ‘…The spirit of the sovereign Lord is on me, to tell the Good News to the poor, to bind up the broken heart in heartache, to open wide them prison doors…’. It’s a statement of bold faith and confidence reminding us what our purpose on this Earth is- the spread the gospel to everyone we meet and to show the love of Jesus with everyone as well. The comfort and inspiration continues with the simple yet revelatory melody “Inseparable”, reminding us that nothing can keep us away from the love of Jesus Christ, ‘…not in death or in life, neither angels nor ghosts, not the past or the future, not the highs or the lows, neither hunger nor wealth, not in sickness or health, not the left or the right, not the day or the night…’. Well done Jon for not being afraid to voice what you really think about Jesus, and reminding us that God is sovereign and holy and worthy of all of our praises! Jon reverts back to a love song in “When We Collide”, an acoustic guitar led poignant and emotional ballad where he imparts that his wife is the only person he longs to be with (again a possible metaphor for the fraction of the extent of God’s love for us! ); yet it is the final two melodies that are sure to inspire us and create more discussion. “Mercy’s War”, another melody overtly referencing Christianity, features the Calvin College Gospel Choir, and is Jon at his brilliant best vocally and lyrically. As Jon points out in the verses various circumstances where we have sinned so much and in many people’s eyes fallen too far from grace; he expertly reiterates in the chorus the reason why we can live, and it’s because of the ‘…wonderful blood of Jesus…’, a sentiment that we can never fully grasp or totally understand, why God would die for us, even if there was only one person on the planet. As Jon recites the poetic verses, and reminds us of the power of Jesus’ blood, I am once again proud of the fact that Jon could accomplish such an ambitious feat this year and still pull it off! The final melody “Before Our Time” is rather introspective as well, and speaks about the transience of life, and how quick the year goes by. Reminding me of something Solomon would write in Ecclesiastes, Jon reinforces the importance of living life to the fullest, as you don’t know how long you have left, and asks the question of what would we do with our life when you know you only have a finite time to live. As we are bombarded with the knowledge that ‘…time is illusion, time is a curse, time is all these things and worse…’, we are encouraged to turn the fear into resolve, as ‘…our time is now, let us sing before our time runs out…’. “…There’s humility in the face of the unknown. The place where you announce your limitations is where growth begins. By accepting the truth of my own shortcomings and my inability to control, I am also able to begin to understand the truth: that I (though godlike in my ability to create and plan, build and destroy!) am not God…” Jon Foreman has done it again! Just like the three EP’s before them, Dawn provides us with the hope, reassurance and inspriration that we all could use a substantial dose of. Though it’s true that Dawn features the most proportion of ‘Christian’ songs to everything else, out of the 4 Eps, and those who do not share Jon’s faith but are still fans of his solo work may be put off by that fact; the truth remains, that Jon’s belief in Jesus pays an immense part, either overtly or behind the scenes, of his music. Each and every of the 7 songs are sure to inspire, confront, comfort, reassure, ask questions and probe, as we try to find out our purpose and destiny, and discover who God wants us to be in this life. Personally I see the 6 song EP, the fourth of the series The Wonderlands; as a reminder that once we embark from the darkness and into the light, ur perspective on life changes, and naturally more and more people would praise God, even if they may not have been an active believer prior to the darkness. Maybe that’s why Jon features more ‘worship’ songs here. Anyway…with Switchfoot still making exquisite and top-notch music, Jon Foreman’s solo work has also benefited from a stellar band career thus far, and I hope and pray that all 24 songs on The Wonderlands are appreciated and loved by all who listen. Well done Jon I can’t wait for many more inspirational projects later on, as well as Switchfoot’s new album in 2016!